Hinshaw, Russell, foster-son (crossed-out and overwritten with "lodger"), age 15, born in Illinois; parents born in Illinois; attended school. Russell Glenn Hinshaw, 74, of Eureka died at 9:27 a.m. yesterday (Feb. 12, 1990) at Eureka Community Hospital. He was born March 24, 1915 in Kansas Township, Woodford County to Clarence and Lida Russell Hinshaw. He married Loraine Ruble May 30, 1941, in Eureka. She survives. Also surviving are one son, Roger R., Kalamazoo, Michigan; two daughters, Carol Hollan, Dixon, and Betty Dean, Hennepin; one sister, Cleo Harper, Hudson and four grandchildren. He was preceded in death by one brother and one sister. EUREKA -- Winifred Lorraine Hinshaw, 95, Eureka, passed away at 4 a.m. Saturday (July 24, 2010) at the Eureka Apostolic Christian Home, where she was a resident. Her funeral will be at 11 a.m. Wednesday at Eureka Christian Church. The Rev. Jennie Churchman will officiate. Visitation will be from 5 to 8 p.m. today at Argo-Ruestman-Harris Funeral Home, Eureka, and from 10:30 to 11 a.m. Wednesday at the church before the service. Burial will be in Olio Township Cemetery. Memorial contributions may be made to the Eureka Christian Church or American Cancer Society. She was born March 15, 1915, in McLean, a daughter of William and Nellie Florence Wilson Ruble. She married Russell Hinshaw on May 30, 1941, in Eureka. He passed away on Feb. 12, 1990. Surviving are one son, Roger (Barbara) Hinshaw, Kalamazoo, Mich.; two daughters, Carol (Curtis) Holland, Dixon, and Betty (Ronald) Dean, Hennepin; six grandchildren, Bryan Bildner, Denver, Colo.; Peggy (Carlos) Galdamez, San Jose, Calif.; Christie (Tom) Houck, Dixon; Jennifer (Mike) Andre, Arlington Heights; and Matthew and Alissa Dean, Hennepin; and six great-granddaughters. Lorraine had worked in food service for Eureka School District 140 and was also a homemaker for many years. She was a member of the Eureka Christian Church, Eureka RSVP and the Eureka Women’s Club. Lorraine was also a cancer survivor for many years and an active participant in Relay For Life. Online condolences may be sent to the family at www.ruestmanharrisfuneralhome.com. 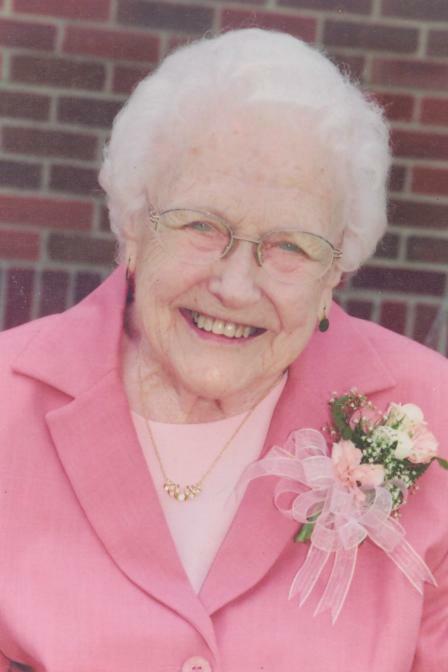 Winifred Lorraine Hinshaw, 95, Eureka, passed away at 4 a.m. Saturday (July 24, 2010) at the Eureka Apostolic Christian Home. She was born March 15, 1915 in McLean to William and Nellie Florence Wilson Ruble. She was preceded in death by her parents, one sister and one brother. She married Russell Hinshaw on May 30, 1941 in Eureka. He passed away on Feb. 12, 1990. Surviving are one son, Roger (Barbara) Hinshaw, Kalamazoo, Michigan; two daughters, Carol (Curtis) Holland, Dixon, and Betty (Ronald) Dean, Hennepin; six grandchildren, Bryan Bildner, Denver, Colorado; Peggy (Carlos) Galdamez, San Jose, California; Christie (Tom) Houck, Dixon; Jennifer (Mike) Andre, Arlington Heights and Matthew and Alissa Dean, Hennepin and six great-granddaughters. Obituary of Russell Glenn Hinshaw. Obituary of Winifred Lorraine (Ruble) Hinshaw. 1930 census, Eureka, Woodford County, Illinois; roll T626-573, ED 18, page 9A, line #44, dwelling #245, family #247. Obituary of Russell Glenn Hinshaw; http://www.findagrave.com. 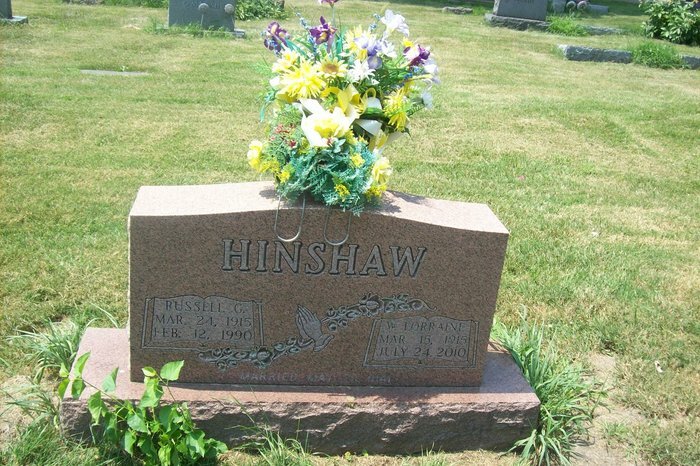 Obituary of Winifred Lorraine Hinshaw; http://www.findagrave.com.